Buckwheat is that horse that everyone is looking for and no one wants to let go of once they’ve found. In my case I have owned him for almost four years and have done most of his training myself. He was bought for a client who had a family emergency shortly after and was unable to purchase him. Buckwheat quickly became my main mount and has been ever since. This horse has done it ALL!! He is willing and eager to please therefore picks up anything I ask of him and thinks it’s the next greatest thing. He has done cutting and sorting, been pasture roped off of, hauled and entered in both barrel races and rodeos. He has done drill team and some ranch type obstacle courses, ridden in parades, on highways, through water, and some of the toughest terrain there is. 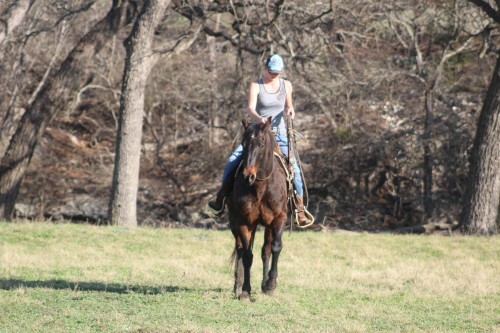 He also has been my main colt starting horse and is great with the babies and letting me hang off and all over him. He won’t get you in a bind with a rope and is strong at the horn. He has NEVER offered to buck, rear, etc even after sitting and is safe as safe gets. Buckwheat will open gates with leg pressure only and will side pass clear across the pasture if you ask him to. Buckwheat has a decent spin and one heck of a stop. He is smooth as molasses and has the most comfortable gaits which is great for me since I have four bulging disks. He does flying lead changes and has even been ridden English and jumped a time or two. Buckwheat pastures great with both mares and geldings and has also been stalled. He eats and drinks great on the road. He’s great for the farrier and has been shod but is currently barefoot and has extremely tough feet even on solid rock. I could go on and on about this amazing horse. I originally took the footage in the video about a year and half ago and then didn’t post him. However, due to injuries I need to cut down and since I don’t feel I’m doing him justice just piddling around every once in a while and learning how to rope of of him, he is being offered to a great home. Located in Harper, Texas but shipping can be arranged anywhere at very reasonable rates and references are available.